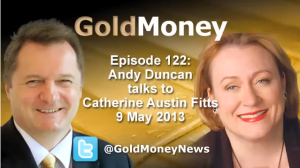 Andy Duncan has the pleasure of interviewing Catherine Austin Fitts, known for her much-read Solari report. With a wealth of experience on Wall Street and time in Washington politics, Catherine’s insights are extremely valuable and much lauded. Catherine discusses the background to how Solari Investment Advisory Services begun and her work and research on the corruption that can be found within some aspects of government and the finance industry — with a focus on the mortgage market. The US economy is reviewed and then Catherine shares her view on gold and silver as money before moving into a fascinating discussion about Bitcoin, digital currencies and the future of currencies. She also discusses the recent market activity in precious metals. 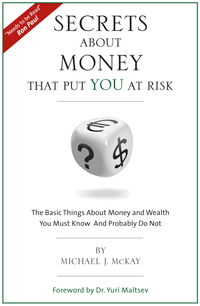 Catherine speculates on the motives of the central planners and how the financial system is evolving, and speculates on whether gold will play a new role in our future monetary system. Lastly Catherine offers some great advice about what one can do to protect and safeguard their future. This entry was posted in World Report. Bookmark the permalink.